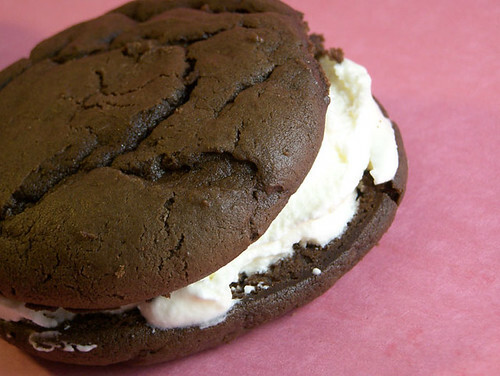 My boyfriend skyped me from work on Friday with a link to the article on Whoopie Pies in the New York Times. “You need to learn how to make these”, he said. Not being one to pass up a baking challenge I made them later that night. Apparently, whoopie pies are the new cupcake, but I don’t know…I’ll stick with cupcakes thanks very much. Not to say they aren’t good because they are, but my issue was with the filling. Personally, I HATE making frosting. It was a miles better experience with my new stand mixer (I completely gave up making frosting with my hand mixer as it was just disaster after disaster with that thing), but it was still a pain and in the end I wasn’t that impressed. I know it’s called Buttercream, but geez, it’s 2 whole sticks of butter! I thought it was butter overload. Next time I’ll be cutting the amount of salt in the recipe by half as both the cakes and the filling were a bit too salty. Also, I’m going to skip the frosting and fill the cakes with low-fat ice cream instead because my boyfriend and I agreed these would make awesome homemade ice cream sandwiches (and I won’t have to feel as guilty since I won’t be eating a pound of butter). I think this would be a great treat to make with/for your family if you have kids, though. To get the round shape, you scoop out the batter with an ice cream scoop, which I know I would have enjoyed helping my mom with. Now that I know how much of a pain it is to make frosting that kind of kills my enjoyment of it, but I would have loved the stuff when I was a kid. True story: I used to take those small tubs of butter at restaurants and mix in a packet of sugar and eat it. Are you surprised I had such bad eating habits that I started a whole blog to try to correct them? Yeah, me neither. These are certainly precious! They look totally yummy to me, but I must agree that ice cream sounds like it would send these little cake cookies over the top!! YUM! why oh why did i look at this post when: a) i have very scant baking materials in this house, rendering me unable to make these right now; b) i have an intense craving for something chocolatey and delicious; and c) it’s too late to even run to mcdonald’s for a mcflurry. damn! i second that low-fat ice cream idea. that sounds heavenly right about now. I still would like to try making them sometime. I’m w/ you though… buttercream grosses me out. I couldn’t imagine making a butter cream filling. I don’t use any butter in my whoopie pie filling. Marshmallow fluff is the way to go.